Fortress Tower of masonry, square floor plan and circular buttresses on the corners, attached to the Hermitage of Santa María de la Torre. The Transhumance centre is located between the Shrine of Our Lady of the Light and the Venta de Piqueras inn. The exhibition seeks to give an overview of a livestock activity which has generated its own grazing culture in the Sierra de Cameros. It consists of three modules with texts, photographic material and the traditional objects used by the herdsmen and shepherds, as well as models and the reproduction of atmospheres. 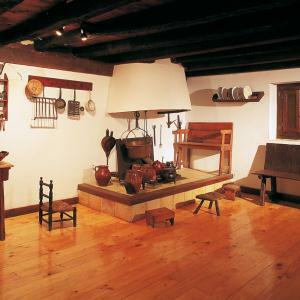 The ethnographic museum is located in a house in the high quarter, near the church, in the calle Real of San Andrés de Cameros. 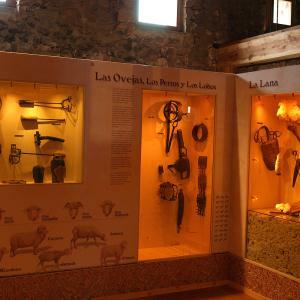 It is divided over three floors and contains an interesting collection of tools, furniture, home and traditional school, in memory of the life and customs of the villages of Pajares and San Andrés, after the building of the Pajares dam. A Roman tombstone from the 1st century AD is of special note. The now restored communal oven of San Andrés is located next to the fountain and the house of the ethnographic museum, near the church. It can be visited. 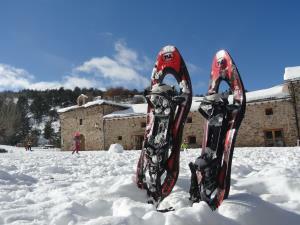 Here is the first Adventure Park in La Rioja!! An adventure at height with wooden towers, trials and challenges of balance, which you can enjoy in exceptional natural settings!! There are two trails of rope and wooden bridges, as well as the climbing wall area and the always exciting zip-lines. 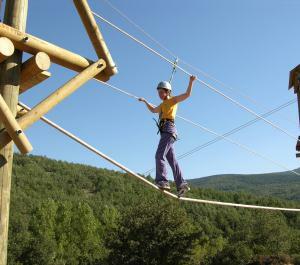 Adventure Park: 12 €, full trail, 9 bridges, climbing wall and zip-line. Remember that here you can also do other activities such as archery, orienteering, cycling, hiking, etc. El Parque de Aventura"Sierra de Cameros" is next to the threshing ground of the Hermitage of San Martín and the hostel in Lumbreras. El Parque de Aventura "Sierra de Cameros" is next to the threshing ground of the Hermitage of San Martín and the hostel in Lumbreras. Technical drivers approved by the Spanish Ministry of Education and Science. Activities: Hiking, routes, snow shoes, cross-country skiing, canyon descent, two-seater hang-gliding, mountain bike visits to vineyards.